This route will have an overall rating of Class III with the most difficult pitch being Class 4, a Medium round trip distance and a Medium elevation gain. Each section of this rating system is described below. 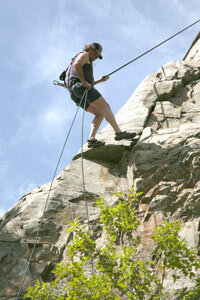 High angle scrambling, moderate cliffs, considerable exertion. A rope might be necessary for beginners. Higher angle cliffs, increased exposure. Rope required for belaying. High angle cliffs with severe exposure. Protection placed by leader. Technical climbing experience is necessary. Direct aid technical climbing. Overall rating in this classification reserved for only the biggest technical climbs such as the North Face of Mount Siyeh or the East Face of Mount Gould. Less than 3,000 feet. Still a pretty long day for those not in shape. 3,000 feet to 4,500 feet. The high end of this range makes for a long day. Over 4,500 feet. Exceptional stamina is required. T Traverse Descent route different than route of ascent. Snow/Ice Snow/Ice Snow and Ice likely on a summer climb. Ice axes and experience required.